Sales automation is the game-changing innovation that brings AI down to Earth. We’ve all heard that artificial intelligence is going to change everything. It’s been described as the most important technology since the Industrial Revolution. It’s been compared to electricity and even to agriculture – that’s right, early homo sapiens’ discovery of how to raise crops and, ultimately, settle permanent communities. And maybe it will be all those things and more: But to get there, it has to be adopted. Artificial intelligence doesn’t just happen: It has to be embedded in some tool, intended for some task. And in the world of digital commerce, it’s happening in sales automation. Sales automation energizes small teams with the power to go head to head with their global competitors. It provides total visibility into the buyer journey and facilitates follow up at each step. Using big data, sales automation tools have already saved thousands of hours of manual data entry and facilitated billions of dollars in sales. Its impact has been especially noteworthy in B2B, where some form of automation is quickly becoming a requirement. 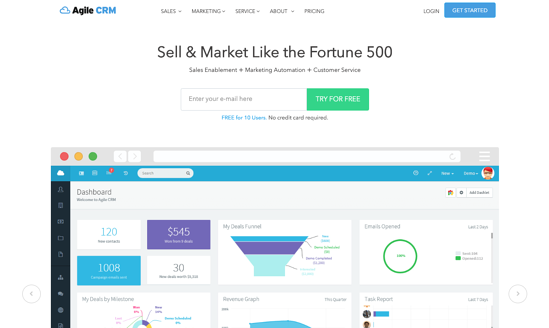 Naturally, there are tons of sales automation apps to choose from. Agile is one of the biggest names in sales automation today. One of the early adopters of AI, Agile has crafted a CRM that can automate workflows across virtually all sales channels, from email to phone. Plus, it continues to collect data and refine its work over time. 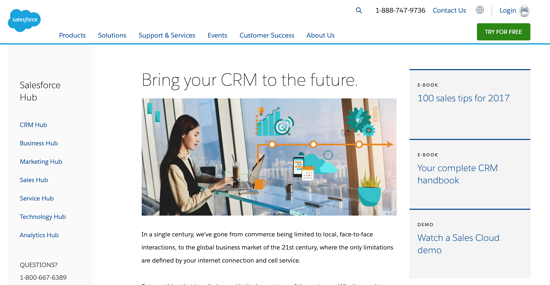 Agile CRM helps you accelerate prospecting by gathering contact information from leads’ web activity, social media, and more. It delivers a full suite of reports and visualizations, allowing you to make the most of its automatic lead scoring at a glance. Integrations are another key to its value: It works with Google, Twilio, RingCentral, and others. Infusionsoft is another major player in the sales automation space. Its robust features and mature interface make it easy to get started with. The app walks you through composing custom, pre-populated quotes by pulling figures from your database. Those quotes are instantly converted into live orders, too. Since it is 100 percent web-based, you can use Infusionsoft just about anywhere. Lead nurturing on all your favorite channels is expedited. It will even help you remember to follow up at key moments in the buyer journey, removing one of the biggest roadblocks to sales success. HubSpot stands in a class of its own as the brand that brought inbound philosophy to the world. 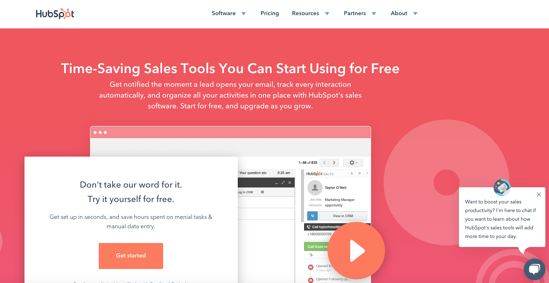 HubSpot Sales crystallizes those inbound sales best practices in a complete e-commerce system. It grants you immense freedom to craft automated sales processes that fit your business like a glove. It is completely paperless, offers a free service tier, and is the easiest to learn to use. HubSpot tools are known for their straightforward custom dashboarding, which lets you see where you stand with your sales leads based on your KPIs. HubSpot Sales is no exception here. The UI is so clean and readable, you’ll find it’s a joy to use even on mobile devices. Pipedrive is a fully mobile optimized CRM with deep Google Apps and third party integration. It empowers you to visualize your sales funnel from end to end thanks to adaptive lead tracking. Lead scoring incorporates multiple priority levels to assist you in recognizing the right actions to take. One of the things that sets Pipedrive aside is how responsive it is. There’s a wide range of modules and layouts, not to mention deeply customizable fields and logic. It may be a good choice for international brands, too: It has built-in support for 13 languages and lots of global currencies. Salesforce was the original name in sales enablement software. Some nimble competitors have been able to innovative faster, but Salesforce is still the master when it comes to the core feature set. It was one of the first systems to hit the cloud, and boasts snappy performance and great security. Still the top CRM by volume today, Salesforce leads the pack in the sophistication of its on-board AI and the depth of its analytics. Of course, this can result in a much steeper learning curve. Luckily, Salesforce has developed terrific educational resources for customer success. It’s worth mentioning that while Salesforce is a full featured CRM, it also has a separate app that manages marketing automation. That app, Pardot, helps manage customer data and keep it all accurate. It also serves as an interface that integrates the sales and marketing pipelines into a cohesive whole. Outreach is an account-based sales automation and communication platform made to be highly scalable. It can integrate into Salesforce, above, or stand on its own. As a “sales engagement platform,” it ties together your phone, inbox, and even your website’s content management system. Efficiency is the big idea behind Outreach, and it automatically keeps you logged in and moving seamlessly between the services and data stores you need. The core goal is to drive more meetings and raise productivity per rep – all built on a flexible role-based framework. Outreach is designed with enterprises in mind and has a number of workflow governance features for large organizations. Groups can be created and organized at will to reflect the structure of your team. The platform is compliance-friendly due to multiple global security certifications. Prospect.io is a prospecting automation platform that abstracts away the functions of a dozen tools that sales pros use regularly. For example, the suite has contact info verification baked right in. From there, you can construct templated drip campaigns that leverage your favorite apps. If you haven’t been satisfied with your email analytics, Prospect.io is the solution that gives you a new lease on life. It keeps deep stats on a per campaign and per message basis so you can amplify your voice. You won’t want to go back to a world before its conversion tracking pixel! Like Outreach, Groove is a sales engagement platform for account-based teams (not to be confused with Groove HQ, a customer support platform by the same brand). It boasts end-to-end sales campaign automation, lead coverage, and calendar integration. Its custom dialer app is 100% “click to call” and automatically logs the data you need, minimizing manual input. That’s essential to quality of life! Groove is impressive for the way it acts as a bridge between your existing tools and Salesforce, smoothing out the kind of data inaccuracies that can crop up as you import entries from one system to another. That makes it a worthy addition to a Salesforce-focused technology stack. 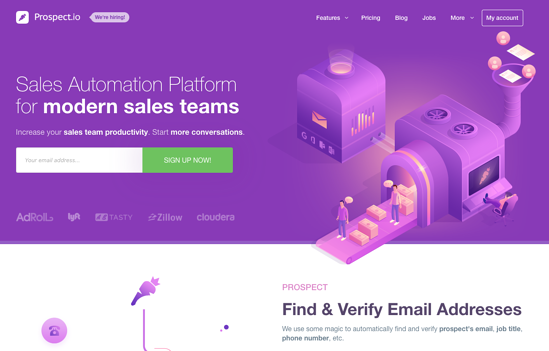 No matter what size your company is, there are awesome sales automation tools out there for you in 2019. As AI continues to gain momentum, automation software is bound to become even more impressive. Don’t wait for the perfect solution to come along: Pick one and get your team used to it. Before you know it, you could be booking more meetings and inking more deals. Have a hot tip on the best sales automation tools? Share your take below.